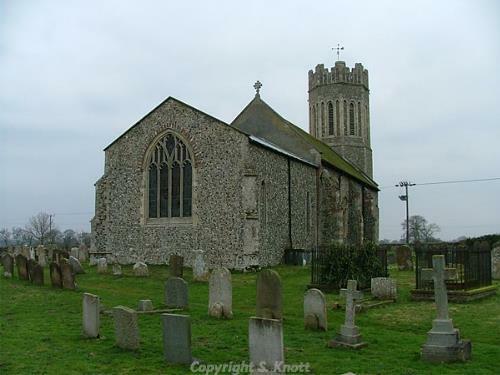 Toft Monks is a small parish situated close to the southeast county border with Suffolk, some 12km from Lowestoft. The parish has an area of 684 hectares, and the land is predominantly agricultural. The parish contains the settlements of Toft Monks, Bull’s Green and Maypole Green. No prehistoric monuments have been recorded, but some objects have been recovered. The earliest of these are a small number of Palaeolithic flint objects (NHER 14289), followed by a Neolithic polished axehead (NHER 33937), a small number of Neolithic or Bronze Age objects (NHER 10718 and 10719), an Early Bronze Age axehead (NHER 10717) and an Early Bronze Age barbed and tanged arrowhead (NHER 10720). Little metal detecting has taken place, but some has successfully recovered objects from a number of periods, providing us with important evidence of the material culture of the area. Finds from the Roman period include coins (NHER 24252 and 28781), as well as bracelet and brooch fragments and a green glass intaglio ring (NHER 33285). No monuments from the Roman or Saxon period have been recorded, however a large entry in the Domesday Book indicates extensive agricultural activity as well as woodland, and values the parish highly. The earliest standing building is therefore St Margaret’s Church (NHER 10711). This building appears to have been built early in the medieval period, and has an early medieval round tower hidden behind a 13th century octagonal skin. The top of the tower is crowned by 15th century battlements and flushwork, with lancet bell-openings flanked on either side by blind lancets. During the medieval period the parish is also known to have been the site of a Benedictine priory (NHER 10721) whose mother house was in Preaux in Normandy. It is this that gave the parish part of its name, the word ‘Toft’ deriving from the Old Norse for plot of land. The exact site of this priory is unknown, as it was suppressed in 1414, but it may have been the moated site to the south of the church (NHER 10707). Other medieval sites include a set of house platforms, field boundaries, ponds and enclosures (NHER 33327), as well as possible medieval ridge and furrow (NHER 45023) and enclosures (NER 45037). Also of unknown location is the medieval Manor House (NHER 10722) that was recorded during the medieval period here. A favoured site of this is the present Toft Monks Hall (NHER 10708), which sits inside a medieval moated site. The present house dates to the 17th century and is unusual and palatial in plan with a full-size basement. Also on the same site is a good timber-framed barn built between 1760 and 1840. A small number of medieval objects have also been recorded. These include four English coins (NHER 16504 and 24252), a possible French coin (NHER 38101), as well as an interesting flat circular seal matrix with a Latin inscription that means ‘Jesus is my love’ (NHER 33285). Similar objects have been recovered from the post medieval period. Toft Monks also has a number of other buildings of architectural interest, including 17th century Priory Farm (NHER 19455), 16th or 17th century Pond Cottage (NHER 20682), 17th century Green Farm House (NHER 30766), and early 17th century Bulls Green Farmhouse (NER 30767). Maypole Green Farm (NHER 24750) is also of note, appearing to date to the 18th century but probably containing the remains of an earlier house of 1680, as is 17th century Boundary Barn (NHER 30765) which is separated from its farmhouse (NHER 30755) by the parish boundary.